Our editors bring passion, dedication, and a range of experience to Harlequin. 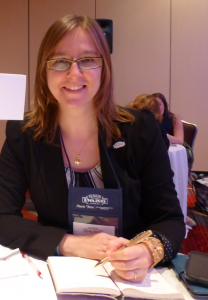 This month meet Dana Hopkins, Assistant Editor for Harlequin Blaze and Harlequin American Romance. When did I join Harlequin? 2011, as Editorial Assistant with MIRA and Overseas. I began my career in academic publishing, but I wanted to move to trade, my real love. I was specifically drawn to Harlequin because I wanted to work with dynamic women crafting heartfelt stories and because I’d heard (quite correctly, as it turns out!) Harlequin employs a wonderful group of people to work with. I’m happiest when. . .
I’m with my own romance hero Graham, trying out a new restaurant or exploring an unfamiliar neighbourhood, or just curled up together reading and drinking red wine or rich espresso. People may be surprised to know that. . .
I’m also an audiobook narrator and technician. I’ve volunteered with the Canadian National Institute for the Blind to make accessible books and magazines since 2009. I love working with a team of dedicated volunteers to make as many books as possible available for people to enjoy. Song: I’m a classical music nerd, and I have an ever-changing rotation of favourite pieces. Currently: “Au fond du temple saint,” the sublime duet from Bizet’s opera Les Pêcheurs de Perles. Movie: The Empire Strikes Back. Star Wars forever. Book: Just one? Impossible! Top five: Cloud Atlas by David Mitchell, The Garden of Evening Mists by Tan Twan Eng, The Shadow of the Wind by Carlos Ruiz Zafon, Possession by A.S. Byatt, and A Tale for the Time Being by Ruth Ozeki. If I could do it all over again, I would. . .
Start travelling earlier. We took our first major trip to Europe last year and there’s so much of the world I want to see! We’re thinking Thailand and Vietnam next. I’m listening to Kate Mulgrew narrate her memoir Born With Teeth, and I’m reading Daire St. Denis’s Blaze debut Sweet Seduction and the second in Elena Ferrante’s Neapolitan Quartet, The Story of a New Name. For more about our editorial team, visit our Editors page. And say hello to Dana on Twitter @Dana_Reads. Dear Editor, how do I create a flawed character? Nice to meet you Dana.